We are thrilled to unveil a brand new theme today! 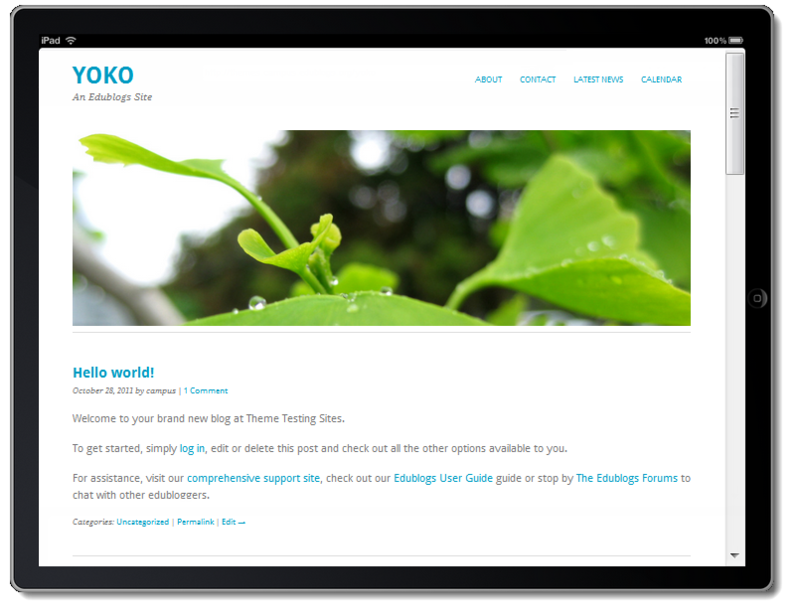 Yoko – as it is called – is our first “responsive” and HTML5 theme. This means that it will look great on all types of devices – including tablets and phones. This works because the theme is designed to move the sidebars and change image and text sizes automatically – all depending on the screen size. You can see the theme in action on Larry Ferlazzo’s Websites of the Day blog. Yoko is already available as a ‘premium’ theme on edublogs.org blogs – for Pro and upgraded student blogs. It will soon be available on all Edublogs Campus sites as well. We’ve got more themes like this in the works to release over the coming months. If you haven’t updated your blog’s look in a while – now might be a great time to do so! is that for free? without edublogs pro?